Here we see a six year old knocking out factoring problems with ease. He doesn't know factoring polynomials is supposed to be hard and that I've had to work with kids 10 years his senior on these exact same problems...only they were frustrated and confused. Here is a very short vid showing him developing his problem solving skills, along with a host of other math skills used for factoring polynomials. Here you can see his progress. 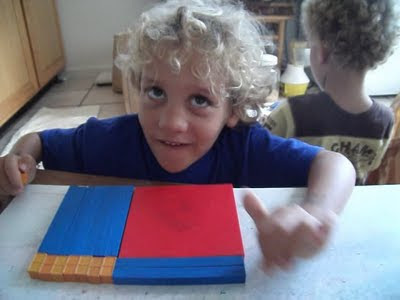 Algebra gets easier and easier as he gets better at counting and making symbols. Learn more at The House Of Math. Labels: Algebra, base 10 blocks, Factoring Polynomials, First Grade Math, Math Enrichment, Math Manipulatives, Mortensen Math.